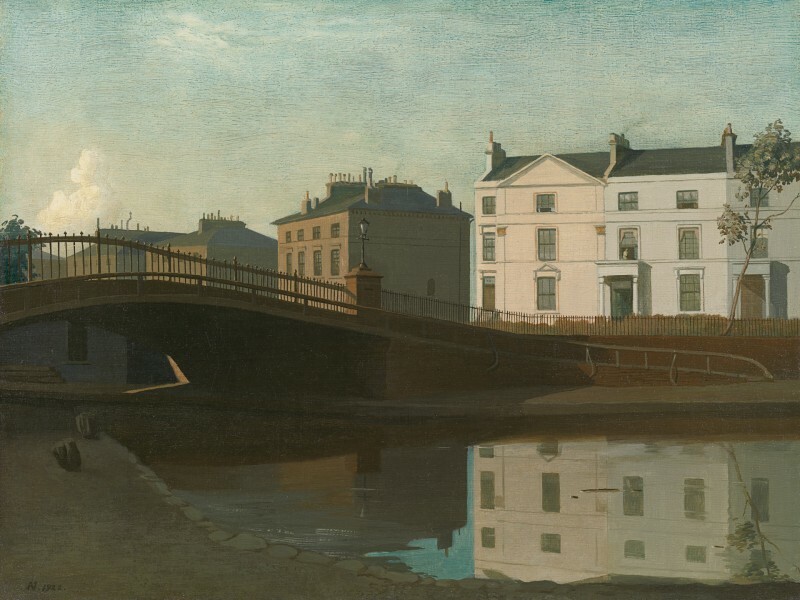 This exceptional work, which depicts Westbourne Terrace Road Bridge as it joins the curve of Blomfield Road before Warwick Place in Little Venice, is thought to be the first Regent’s Canal painted by Algernon Newton, using a new method developed from his intensive study of Old Master paintings at the National Gallery. Newton went on to paint a number of canal views, including The Regent’s Park Canal, Paddington, 1930, in the collection of the Royal Academy of Arts, London, and became known to his contemporaries as “the Regent’s Canaletto”. The appeal of his unusual subject matter and the sophistication of his technique were immediately noted by the press. While on exhibition at the Grosvenor Galleries in the winter of 1922, this painting was selected for particular praise by Frank Rutter in the Sunday Times: ‘…in the corner of the gallery, is another beautiful little picture by an artist whose work I have not previously remarked. “The Regent’s Canal” (103) by Mr. Algernon Newton, is a charming view of houses seen across the water painted with a glow, sincerity, and clarity approaching an early Corot…I base all my hopes on his “Regent’s Canal”, which, though adhering to good old standards of painting and draughtsmanship, strikes a new note in contemporary art’. His colleague at The Times continued the theme more succinctly, stating that the painting: ‘though quite modern, has some of the virtues of a Canaletto’. In 1919, Newton returned to London and a period of financial insecurity previously unknown, during which he sought to completely restructure his technique and style. “The only place that seemed to hold out some prospect of assistance was the National Gallery, where by studying the Old Masters, I might be able to glean something from them”. In particular, Newton undertook a detailed study of the exquisite tonal relationships achieved by the great Venetian painter Canaletto: “I had never before seen such accurate and sensitive values in any other master concerned with the rendering of light in landscape”. Their secret, he felt, lay in the dual tints of the underpainting, observed from nature: “The cool grey shadows and warm golden lights, no wonder the street glowed with golden sunlight, no wonder Canaletto’s canal scenes shimmered in the sun’s rays: were they both not painted with the same brush dipped in truth?” Gradually Newton developed his strikingly original technique based on his studies of the old master, as Nicholas Usherwood describes: ‘This method consisted firstly of an underpainting, or duochrome base as he called it, of cork black and cyanine blue for the cool, shadowed areas, and raw sienna and raw umber for the warm, sunlit areas. Local colour was then laid in over this, in a series of thin paintings and glazes, the pure glaze using the pure colour, without any white added, and thinned with enough linseed oil to allow it to be easily “washed” on with flat sable brushes – a process not unlike watercolour painting and giving him, as he himself put it, a similar luminosity and transparency but without losing the solidity and strength of oil painting.’ Newton recalled this period of exploration as “the actual beginning of a completely changed technique and an entirely new outlook in my painting”, and in his meticulous ‘Catalogue of works’, records this painting as the ‘first picture painted by my method’. We are grateful to Nicholas Newton, the artist’s grandson, for his assistance with the cataloguing of this work. Born 23rd February 1880 in Hampstead, Algernon Newton was the fourth son of Arthur Henry Newton, Managing director of Winsor & Newton Limited, and Georgiana Tregonning Newton (née Nicholls), whose family lived at Hayle in Cornwall and owned Wheal Alfred Mine. Newton was the grandson of the artist and businessman, Henry Charles Newton, one of the founders of Winsor & Newton, the celebrated firm of artists’ materials. From the age of nine, Newton had a very unhappy time at Farnborough School before receiving private tuition to enter Clare College, Cambridge in 1899. He left without a degree the following year to train at Frank Calderon’s School of Animal Painting in London. As early as 1903, Newton had his painting, The Arab ‘Rebab’, accepted and hung “on the line” at the Royal Academy Summer Exhibition. After three years at Calderon’s School, Newton took classes at the Slade School of Art c. 1903-4 before continuing his studies at the London School of Art in Kensington c. 1906-7. The artist married Marjorie Rider in 1903, with whom he had four children. After living in Dorset, the family moved frequently with brief periods in Buckinghamshire, Switzerland and British Columbia before Newton joined the Royal 1st Devon Yeomanry in 1916. Later that year he was invalided out of the army, having suffered double pneumonia and returned to his family in Cornwall, where he had built a house, Bodriggy, in Lamorna where they were living amongst the community of artists who had settled there which included Laura and Harold Knight, Alfred Munnings and Lamorna Birch. His horror of war and his strong pacifist feelings influenced his work throughout his life. In 1918 the family moved to Theale, Berkshire, before Newton left home to make a new life in London with Emily Richards (known as Janetta), who would become his second wife following his divorce in 1921. Following his early success at the Royal Academy of 1903, Newton exhibited there regularly from 1924. He was elected an Associate RA in 1936 and a full member in 1943. A retrospective of his work was held at the Royal Academy in 1980. Newton’s first one-man show was held at the Eldar Gallery in 1920, though he went on to exhibit with the Leicester Galleries in 1931, 1933 and 1951. The work of Algernon Newton is represented in the public collections of City of Birmingham Art Gallery; Brighton Corporation Art Gallery; Bristol Museum & Art Gallery; Buxton Museum & Art Gallery; Claire College, University of Cambridge; Beecroft Art Gallery, Essex; Glasgow Museums Resource Centre; Ferens Art Gallery, Hull; Leamington Spa Art Gallery & Museum Walker Art Gallery, Liverpool; the Royal Academy of Arts, Tate Britain, the Victoria & Albert Museum and the Government Art Collection, London; Nottingham Castle Museum and Art Gallery; Buxton Art Gallery; Lady Lever Art Gallery; Harris Museum & Art Gallery, Preston; Touchstones, Rochdale; Pannett Art Gallery, Whitby; National Trust, Wimpole Hall and Anglesey Abbey; National Gallery of Victoria; National Gallery of New South Wales, Sydney; Tatham Art Gallery, Pietermaritzburg Art Gallery; Minneapolis Institute of Art and The Metropolitan Museum of Art, New York. The Times, op. cit., p. 15. The artist, cited in Algernon Newton RA 1880-1968, exh cat, Graves Art Gallery, Sheffield, 1980, (npn). The artist, cited in ibid. The artist cited in The Peculiarity of Algernon Newton, Andrew Graham-Dixon, exh cat, Daniel Katz Gallery, 2012, p. 8.